Central Iowa Homes - SOLD or I'll Buy It! SOLD or I'll Buy It! The only way I could feel comfortable and confident in being able to offer this exclusive program is after years of perfecting the most productive marketing plan in the area. I am so confident in my current plan that it NEVER varies, whether you have a smaller home or luxury mansion, the plan is the plan and it flat out works! One of the biggest dilemmas when selling a home is deciding whether to hire a real estate agent or try to sell it yourself. Hiring the wrong real estate agent is risky because your home could end up sitting on the market for a long time without an acceptable offer or you could be forced to sell and compromise your bottom line. You could even end up owning two homes or none at all!! Well, our “SOLD or I’ll Buy It!” program solves this dilemma. My approach in selling a home in Central Iowa is not your passive, traditional marketing. Instead I have created a proven marketing plan, which includes phone prospecting, social media, visual tours, and many other online techniques to engage buyers to look at your home and to ensure you get to the closing table. It has been proven to be the most effective marketing plan in this type of market. That’s why I sell more than 10 times more than the typical full time agent! Do I have to do the “SOLD or I Buy It” program? 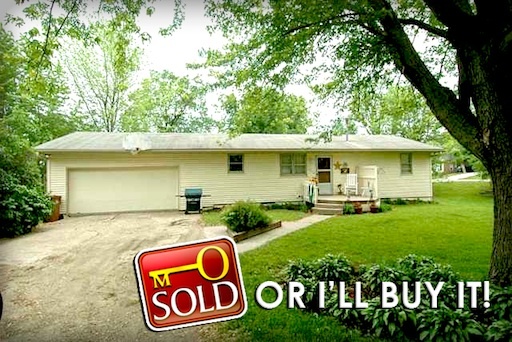 The Misty Soldwisch Team just closed on this buyout home in St. Charles, IA. Congratulations to the sellers, Justin and Melissa Ewoldsen, who used the program to help them make a move to their next home!